Therapeutic monoclonal antibodies target specific antigens found on the cell surface, such as transmembrane receptors or extracellular growth factors. In some cases, monoclonal antibodies are conjugated to radio-isotopes or toxins to allow specific delivery of these cytotoxic agents to the intended cancer cell target. Small molecules can penetrate the cell membrane to interact with targets inside a cell. Small molecules are usually designed to interfere with the enzymatic activity of the target protein. As with any drug, targeted cancer therapies typically have several different names. One or more names is used to designate the chemical compound during development; if successful, the drug receives a generic name and then a brand name used by the pharmaceutical company for marketing. For example, the small molecule STI-571 became known as imatinib (generic name) and is marketed by Novartis under the brand name Gleevec™. The FDA has approved multiple targeted drug cancer therapies, and many more are being studied in clinical trials either alone or in combination with other treatments. A partial list of currently approved targeted therapies for solid malignancies and their molecular targets is provided below. Contributors: Richard G. Abramson, M.D. Suggested Citation: Abramson, R. 2018. 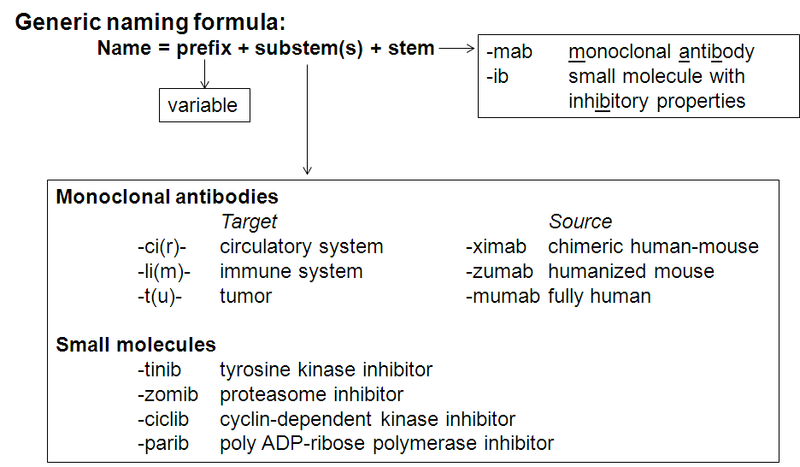 Overview of Targeted Therapies for Cancer. My Cancer Genomehttps://www.mycancergenome.org/content/molecular-medicine/overview-of-targeted-therapies-for-cancer/ (Updated May 25).